Imagine you are in a shop, looking to buy a fancy pair of shoes. It could be Jimmy Choos or Air Force Ones, depends on what you like. You look around, find them in the alley on the left, try a few pairs on and decide on the size and color. You like how they look on you, decide that you are going to buy them, and head to the counter. You stand in line, wait for your turn, come to the counter, put your shoes on the counter and… you leave. To the astonishment of a surprised salesperson. How often does that happen in real life? I bet not too often. Yet, it happens in 69% of the cases online. It’s mind-boggling, isn’t it? I’ve been working on improving online businesses for nine years, yet it never ceases to amaze me how often it happens. Sure, there are many reasons why this happens (more on this below) but still, what practically never happens in a real word is a norm online. And this is the reality we have to live in. At least for now. So where does the 69.23% number come from? There were a lot of independent studies on the subject. 37, to be exact. This number is an average of all these studies. It’s better to have one number than pick and choose from any of the 37. It’s also probably the closest to reality. A large portion of cart abandonments are simply a natural consequence of how users browse e-commerce sites – many users will be doing window shopping, price comparison, saving items for later, exploring gift options, etc. These are largely unavoidable cart and checkout abandonments. They are an equivalent of foot traffic in the store, who are browsing, but not yet ready to buy. That’s fine. 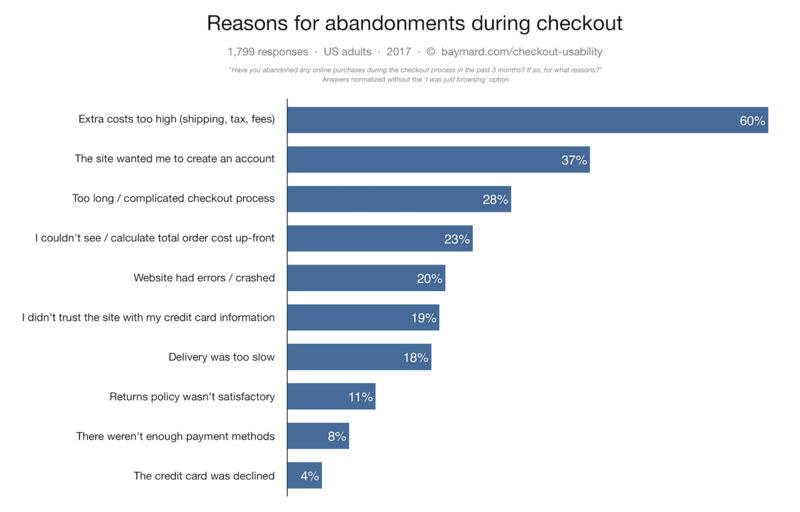 But there are many reasons for cart abandonment that are fixable and avoidable. This is costing businesses real money. A lot of these issues can be resolved. As they should. A large-scale checkout usability testing shows that an ideal checkout flow can be as short as 12-14 form elements (7-8 if only counting the form fields). So if you’re an online shop, you should aim at 7-8 fields ideally, a little bit more if absolutely necessary. Makes sense, right? There’s so much to improve and to gain from only optimizing checkout experience. It’s such a shame it’s still one of the most painful experiences in most of the shops. While improving the effectiveness of online business at Nextommerce, I have seen the average improvement in the conversion rate of about 30%. That’s 30% more revenue for the business. Pretty sweet. PS. Imagine a “date abandonment rate” of 69%. You arrive early, wait for your date to come, she (or he) arrives a few minutes later, takes off a coat, takes a site opposite you and… gets up and leaves. 69% of the time. The level of frustration in the world (and the number of wars) would be unimaginable.